There's always something to learn in genealogy. That's part of the fun! Archives wants to help you learn more about how to find your ancestors, so we have started weekly livestream presentations! These free videos are held every Wednesday at 1:00pm Eastern/10:00am Pacific. Amy Johnson Crow is your presenter for these 20-minute videos. The livestreams are free. 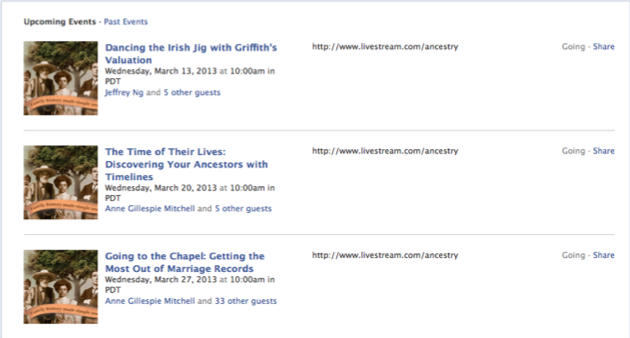 You can learn about upcoming topics and sign up for reminders on Archives' Facebook page. To see all of livestreams that are coming up, click on the "1" near the top of the page and then click on "Events." To sign up for email and Facebook reminders, click on the topics you're interested in and then click "Join." Can't make it on Wednesdays at 1:00pm Eastern? We have you covered. All of the past livestreams are added to Archives' YouTube channel. Join us on Wednesdays at 1:00pm Eastern/10:00am Pacific for the live presentation or later on YouTube. Either way, you'll have fun learning new ways to find your ancestors.